Location : Living in a world of avarice and deceit. Blimey the trouble I've had getting here!!! 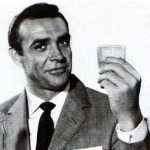 Anyway, hello chaps my name is Saunders...V Section, some of you may remember me from the old MI6 forum before it changed and thank you to those here who at the time invited me to join this site. The reason I didn't was that I felt I needed to give the new MI6 site a chance and as I hadn't been on it for that long or invested as much effort in quality posts my sense of loss at the changeover was not as great as for some of you. Unfortunately for me personally with the loss of so many great members the site lost it's identity and after a few months of trying to recapture the old spirit I lost heart and stopped visiting the site, in fact I stopped being a fan altogether, the Bond book collection (The Official Saunders Archive), corgi cars, toy Walter PPK's, tuxedo and the Roger Moore clock went in the loft and I spent a year living a fairly normal life. Fortunately catching the SKYFALL press conference on tv with it's now traditional golden moments of Daniel looking awkward and Babs gushing about the latest director I felt sanity being restored and needing the world of James Bond 007 back in my life. I retrieved all the collection from my loft and tried again with the MI6 forum and while it's still a well run forum for me it had lost it's magic. I was so pleased to find your really great site with so many familiar members and even if I have seemed to manage making joining it the most complicated procedure possible, I'm really glad to at last be among you. So here I am, hopefully a little more mature, wiser and very slightly less illiterate (though I still don't really understand how to use a computer so please bear with me), I hope you'll welcome me and if I have unintentionally upset any of you in the past I apologise I wouldn't of done it consciously...well unless I thought it was really funny! I hope to become an active member of your site and look forward to getting reacquainted with those from the past and look forward to meeting those of you who haven't yet had the misfortune of having to endure my posts! Welcome, Saunders. Good to see V Section is still up and running. Good to see you here, Saunders. If you contact an admin, perhaps they could help you get your original username back. Hello, Saunders. Careful of that sliding cafe door, now ;) . Welcome, Miss Paula. If you started the Bond saga with Casino Royale then the other films must seem very strange indeed. Less Speedos for starters. Hi Paula. Nice to have you here. Sorry it took so long to register. The admins might need to sort that issue out, as it seems to be a recent problem. Saunders, great to have you on board, mate. Your wit has been missed. And a warm welcome to Paula007, Stephen Woolston and anybody else I may have missed. Hi. Great place. I can't believe I've only just found it, I've been reading posts here for the last hour after getting home from seeing Skyfall. What a great Bond film, it's def one of the best. My name's not Ralph Fiennes (obviously), my name's Dan. I'm 19 from Colchester and I LOVE the Bond films. should be here for a long time, lots of good things to read. Thank you. Have you seen Skyfall? Alas, no. As an American, I have to wait until 11/7. Heck, I know the whole story now. I have no self-control when it comes to spoilers. Good to see some of the new visitors actually signing up. At one point last night, there were 140 guests. Well it is that time of year when a new 007 movie pops up, the folks come rolling out of the woodwork. Sadly this does not happen when a new book is released. That would be the fault of the Fleming estate. There's clearly no game-plan and no blue-print for moving the series forward and making it popular again. They just sort of lick their finger, stick in the air, and make a decision based on which way they perceive the wind to be blowing. It's good to see a lot of new blood coming into the forums. However, I suspect that "Ralph Fiennes" is not the actor but is probably just a fan of the actor.